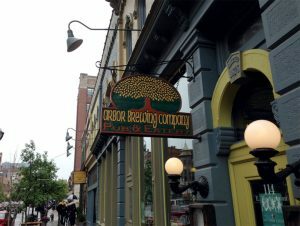 MICHIGAN ELT extends a warm invitation to all CGC attendees to join us for the CGC Evening Reception on Sunday, June 10, at Arbor Brewing Company “ABC” Brewpub in downtown Ann Arbor. This will be a casual affair; a chance to catch up with colleagues and friends (over a local brew, if you wish!) and continue conversations from earlier in the day. Hot and cold hors d’oeuvres will be served, and your first drink is on us! The walk from Weiser Hall to ABC brewpub (15-20 min, directions HERE) runs right through campus, allowing you to walk along the famous “Diag” and see iconic U-M buildings such as Hatcher Graduate Library, Angell Hall, and Hill Auditorium. If you’d like company on your walk to the reception, a group will be walking over together from Weiser Hall right after the CGC sessions end for the day (a few minutes after 5:00 PM). To join, please meet on the ground floor by the double doors farthest from the elevators. If you choose to drive to the reception from Weiser Hall (5-7 min, directions HERE), there is a convenient public parking garage across the restaurant from the brewpub on 4th Ave and Washington St. If you’re staying at the Graduate Ann Arbor hotel, ABC brewpub is conveniently located just a couple blocks from the hotel (directions HERE). We look forward to welcoming you to Ann Arbor and the University of Michigan, and hope to see you all at the reception! Please note: Arbor Brewing Company has asked us to remind attendees that due to the nature of the establishment, all children in attendance must be supervised at all times.